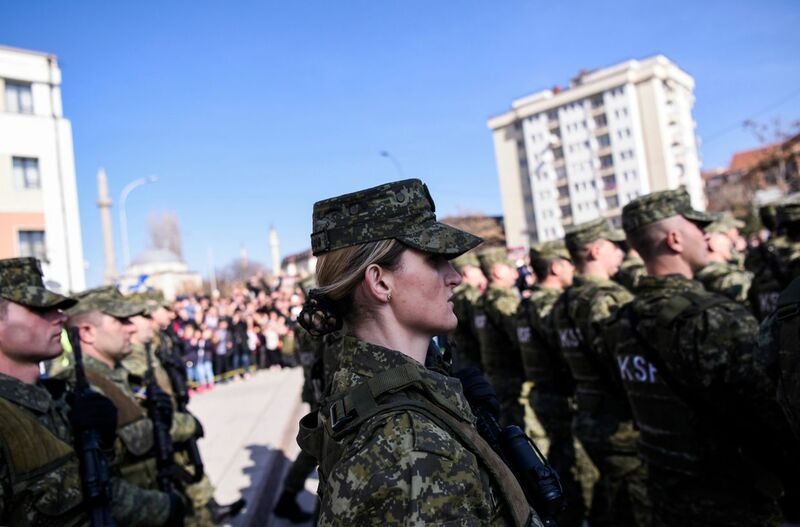 Pristina, Feb. 17, 2019: Members of the Kosovo Security Force march in the capital to mark the 11th anniversary of the Balkan nation's declaration of independence. Neighbouring Serbia still regards Kosovo as a rogue province, and settling the border between the countries is a fraught and unfinished process. For 20 years, the issue of national borders in the Balkans has been sacrosanct, a question no one dared to raise for fear of tearing open unhealed wounds from the wars of the 1990s. No longer. U.S. President Donald Trump’s administration – keen for a foreign-policy achievement as peace talks with North Korea fall apart, and suddenly willing to start redrawing international frontiers in the Middle East and elsewhere – is pushing for a deal to end the decades-old dispute between Serbia and Kosovo. That dispute has its modern roots in a 1999 war that saw the North Atlantic Treaty Organization military alliance drive Slobodan Milosevic’s army out of the predominantly Muslim region after Serb forces were accused of war crimes. While Kosovo declared its independence in 2008, Belgrade continues to regard it as a renegade province, one dear to the soul of nationalists who see it as the birthplace of Serbian culture. Signalling his intent, Mr. Trump sent letters to both Serbian President Aleksandar Vucic and Kosovo President Hashim Thaci in December, introducing the possibility of the two men signing a “historic accord” in front of Mr. Trump at the White House. “Failure to capitalize on this unique opportunity would be a tragic setback, as another chance for a comprehensive peace is unlikely to occur again soon,” reads the U.S. President’s letter to Mr. Thaci, which the Kosovo leader posted on his Facebook page. Suggesting a wider U.S. openness to reconsidering international borders, Mr. Trump last week signalled his support for Israel’s 1982 annexation of the Golan Heights, Syrian territory that Israel has occupied since a 1967 war. “After 52 years it is time for the United States to fully recognize Israel’s Sovereignty over the Golan Heights,” Mr. Trump wrote on his Twitter account, ahead of a visit to Washington by Israeli Prime Minister Benjamin Netanyahu that begins Monday. One plan for Serbia-Kosovo that has surfaced in local media would see Belgrade – in exchange for recognizing Kosovo, and clearing the way for it to join the United Nations and other international organizations – retake control of a predominantly Serbian-populated region around the city of North Mitrovica in northern Kosovo. It’s an area that has never accepted it was part of an independent Kosovo – it is still the Serbian flag that flies from homes and street lamps around North Mitrovica, and the area defiantly sends MPs to Serbia’s parliament. One version of the pact that has been given trial-balloon treatment in local media would also see Kosovo take possession of the Presevo Valley, an Albanian-majority region in the south of Serbia. 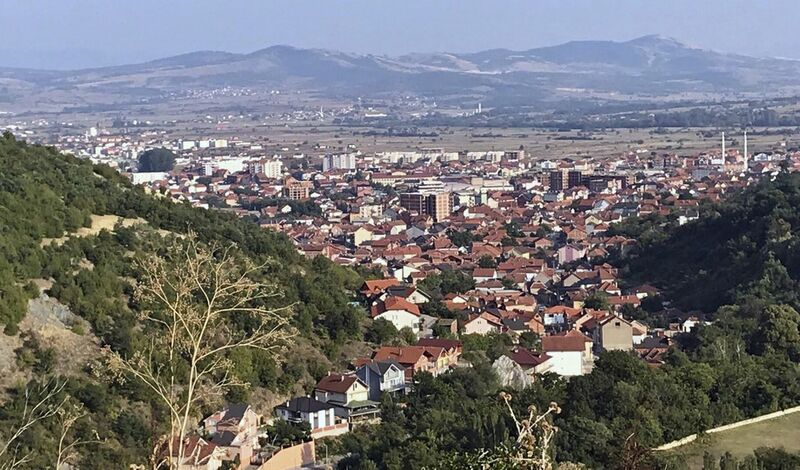 Mirroring the situation in North Mitrovica, Presevo residents resent Serbian rule to the extent that Belgrade struggles to collect taxes in the region. The town of Presevo lies in the majority-Albanian part of southern Serbia that borders Kosovo. Neither ethnic Albanians nor Serbs pay much attention to talk of changes to the frontier between Serbia and Kosovo: they are too busy trying to eke out a living in one of the nation's poorest regions. 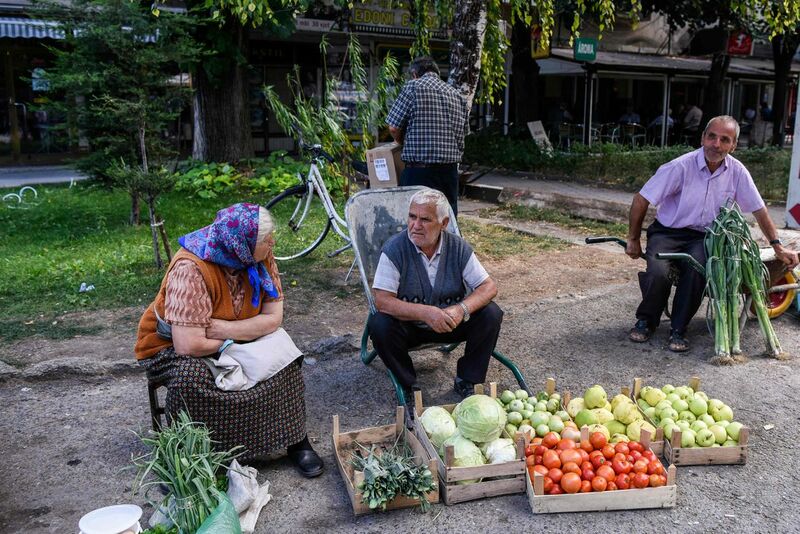 In Presevo, street vendors sell vegetables by the side of the road. The region saw a brief conflict in 2001 when ethnic Albanian guerrillas took up arms demanding to join neighbouring Kosovo. Talk of “peaceful ethnic cleansing” – as critics call the plan – has alarmed some Western leaders, primarily German Chancellor Angela Merkel, who has repeatedly dismissed the idea as dangerous. Germany, the United Kingdom and other governments fear that territorial exchanges between Serbia and Kosovo could reignite old quarrels over borders, and who should rule whom, in other sensitive parts of the Balkans. There are particular concerns about the Serb-populated part of Bosnia-Herzegovina, where talk of declaring independence from Sarajevo, and perhaps uniting with Serbia proper, has increased in recent years. That land swaps are being discussed, even quietly, is considered a huge gain for Serbia, which until Mr. Trump came to office was being told by the West that it needed to simply accept Kosovo’s independence if it wanted to join the European Union or other Western institutions. 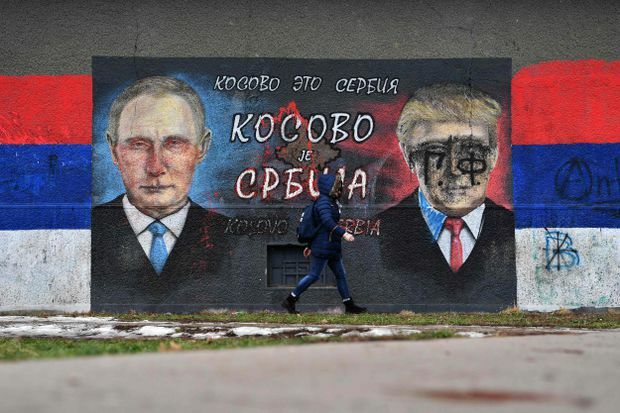 “President Trump has made some corrections to the U.S. attitude toward Kosovo. They finally said that the Kosovo story isn’t finished yet,” said Milovan Drecun, an MP from Mr. Vucic’s party who heads the Serbian parliament’s committee on the Kosovo issue. “The moment is better for Serbia now that Washington has opened space for negotiations on the status of Kosovo." 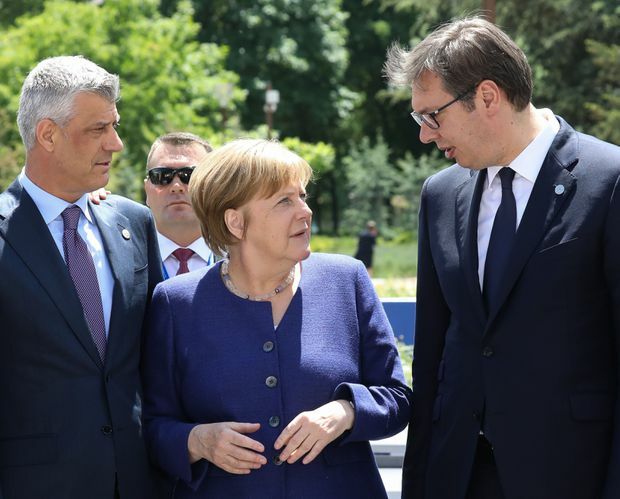 Kosovo's President Hashim Thaci, left, and his Serbian counterpart Aleksandr Vucic stand beside German Chancellor Angela Merkel at an EU-Western Balkans summit in Sofia, the Bulgarian capital, in 2018. Underscoring the distance left to go before any signing ceremony at the White House, Mr. Drecun said that while adjustments to Kosovo’s borders would be welcome, there could be no formal recognition of Kosovo as an independent state, only as a “temporarily” autonomous region of Serbia. Ardian Arifaj, political adviser to President Thaci, took the opposite position, and told The Globe and Mail in a telephone interview that territorial swaps could not be part of any negotiation with Belgrade. “There will be no exchange of territories, no borders along ethnic lines. Under any agreement, Kosovo must maintain its multiethnic character,” he said. But, Mr. Arifaj said, “border demarcation” – defining the exact frontier between Serbia and Kosovo – is one of the issues on the table when Mr. Vucic and Mr. Thaci meet. That language leaves plenty of wiggle room for discussing the fate of the chunk of land that lies north of the Ibar River, which ambles through northern Kosovo and divides the city of Mitrovica into its de facto Serbian and Albanian halves. North of the Ibar, the population is upward of 90 per cent Serbian (compared with 92 ethnic Albanian for the whole country). Similarly, the population of the Presevo Valley region was 89-per-cent Albanian, according to a 2002 census. A 2011 census was boycotted by the ethnic Albanian population. Analysts say that window was formed by geopolitical interests – in Washington, Brussels and Moscow – that happen to have coincided over the Kosovo question. Mr. Trump’s desire for a peace deal, preferably ahead of next year’s U.S. election campaign, coincides with the efforts of European Union foreign policy chief Federica Mogherini, who is pushing, despite German-led opposition, for a resolution before her own five-year term in office ends in November. Russian President Vladimir Putin, whose government has blocked the recognition of Kosovo at the UN and other international fora, is also believed to support the concept of a land-for-peace deal, in part because of the precedent it could set for Russia’s disputes with its neighbours. The clearest parallel might in Ukraine, where Russian craves international recognition of its 2014 annexation of the Crimean Peninsula. Pro-Russian separatists also control the eastern Donbass region of Ukraine, as well as Georgia’s breakaway republics of South Ossetia and Abkhazia, and Trans-Dniester region of Moldova. Some veteran negotiators believe that Mr. Putin is the real driving force behind the land-swap idea, even as the Russian leader has let Mr. Trump take the lead on the process. Talk of a deal to settle the Serbia-Kosovo dispute began in earnest last summer, shortly after the U.S. and Russian leaders met behind closed doors at a summit in Helsinki, with no one but a translator present. Pristina, Sept. 29, 2018: A man gestures as others protest with flags against the Kosovo President's proposed border deal with Serbia. But even if Mr. Vucic and Mr. Thaci come to an agreement, both will struggle to sell it to their own populations. Kosovo’s parliament recently adopted a negotiating platform that precluded any exchange of territories. 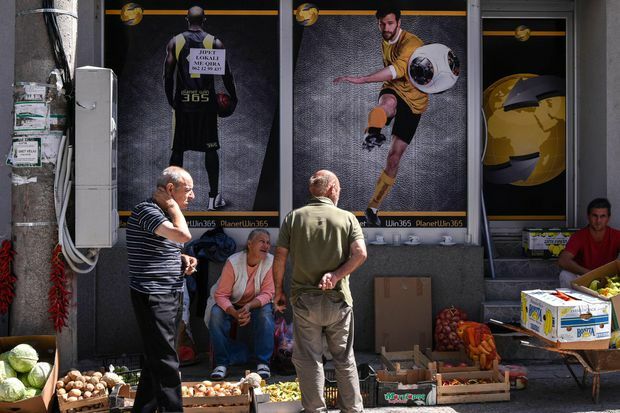 In another blow to the talks, the Kosovo government recently imposed a 100-per-cent tariff on all goods imported from Serbia. Mr. Vucic is similarly hamstrung by a public that’s not in the mood for any compromises on the Kosovo issue. The Serbian leader’s authority has been rattled by weekly protests in Belgrade and other cities against his rule. While the demonstrations were initially dominated by pro-Western Serbs who want to see greater democracy in the country, right-wing nationalists have also taken part. Saturday’s demonstration featured speeches and handmade signs warning Mr. Vucic not to “surrender” Serbia’s claim to Kosovo. Serbian political analyst Aleksandar Mitic said “90 per cent” of Serbs were against a deal that involved recognition of Kosovo’s independence. He predicted the anti-Vucic protests would swell if Mr. Vucic made the rumoured land-for-peace pact. Dusan Janjic, the president of the Belgrade-based Forum for Ethnic Relations, said it was ironic that it was Mr. Trump – who until now has given little indication that he’s interested in the Balkans – who was behind the sudden peace push. Presevo street vendors sell vegetables by the roadside. Editor’s note: An earlier version of a map in this story mis-identified the region south of Kosovo as Macedonia. In fact, the area has been known as the Former Yugoslav Republic of Macedonia since 1991, and was recently renamed North Macedonia. The map has been updated.